"Be The Next Great Legend" was the tagline for NHL 12 a year ago. With NHL 13 being released in two weeks on Sept. 11, gamers will still be able to be that great legend, except this time around they'll have few new and interesting options. Mario Lemieux, Wayne Gretzky and Gordie Howe were among nine playable NHL legends in NHL 12. For the latest installment of the game, EA Sports will make some history. "We selected Hayley Wickenheiser and Angela Ruggiero for their leadership qualities on the ice and within the community," said EA Sports NHL general manager Dean Richards. "Both athletes are champions who have been a positive force in driving women's hockey forward, and creating further opportunities for young women in the United States and Canada to participate in the sport, either competitively or recreationally." In NHL 12, female characters could be created and used in the game for the first time ever thanks to the frustrations from a 14-year-old girl from Buffalo, N.Y. Now, female gamers will be able to use two of the greatest women's hockey players ever in several modes in the game. 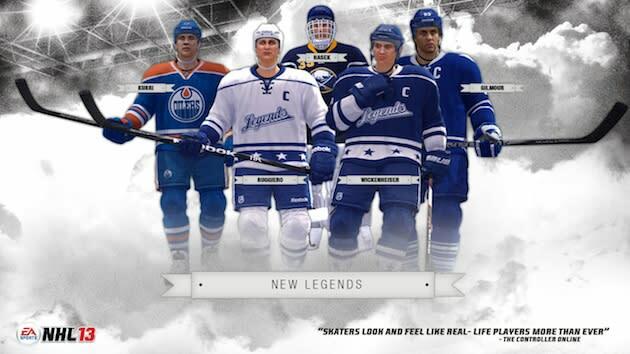 According to EA, the legends can be used in the Be A Legend mode, allowing users to play their entire career with one of hockey's greats; on Legends teams -- Team Wickenheiser and Team Ruggiero -- made up of current and former NHL stars; and Hockey Ultimate Team and Be A GM modes. It's only a matter of time before women's soccer appears in EA's popular FIFA series. So next in line, at some point, would be including regular female characters and teams in basketball and hockey video games on more than just a special basis, as we see with Wickenheiser and Ruggiero's inclusions in NHL 13. Game producers are still finding a way to incorporate such a new addition without making it look like it was rushed into the game.